The last time I was at Roy's it was 2003 and I was on what is still the most epic adventure I've ever been on or likely will ever be on. There are a couple of you (you know who you are) who will understand the significance of this place. Roy's has changed a bit since then. It's no longer abandoned completely. There's a little convenience store that sells old fashioned soda in glass bottles and pricey gas for the traveler who forgot to fill up before crossing the desert. Nowadays, you'll find a tour bus stopped to take pictures or a social media influencer creating content for her feed here. Ah....the days of Instagram have changed so many places. In '03 there wasn't a soul to be seen here. It felt like a truly abandoned desert oasis. Maybe it was. Maybe it only felt that way because I was a young, small town girl trying to figure life out after a loss that shook me to my core. There is one thing I know for sure. I had headed west in '03 looking for answers....direction. I am certainly am not the first person to do this. What I know now is that the open road doesn't give you the answers. It can't. What it can do however, is facilitate the opportunity to look within yourself. WITHIN is where the answers lie. How fun to share this place with such a kindred spirit. Deanna - You will have many more grand adventures. This I know for sure. Thank you for sharing this one with me. I arrived a little early for Last year’s SPARK workshop and met up with my favorite muse DeeDee and some new and old photographer friends in Palm Springs. I provided the model. DeeDee, Emil of Slice of Lime Photography and Stephanie of Philter Photography provided the wardrobe. We had no plan. We just through it all together last minute and went out to play. I have found that creating for myself has been my greatest opportunity for growth in this business. 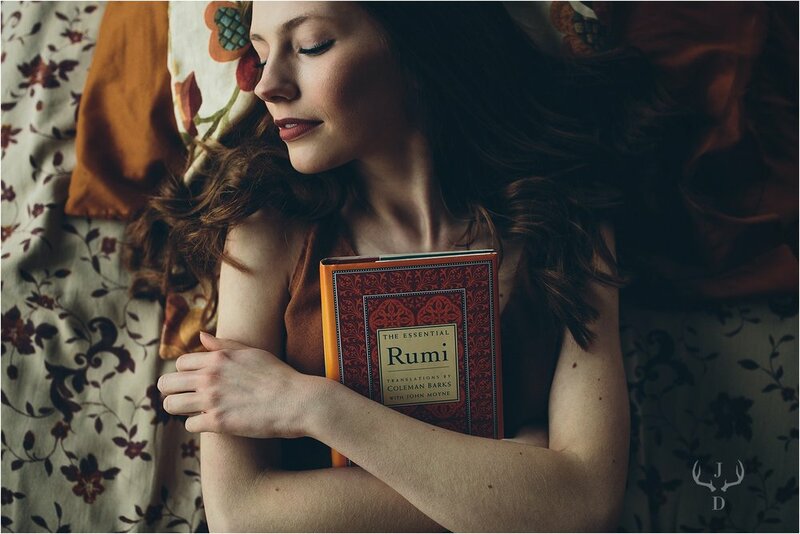 Creating imagery purely for the joy of it is so fulfilling. So for any photographers out there that may read this…what have you created lately that’s been just for you? Lots of things happening over here! My class of 2019 Spokesmodel team is officially full! So exciting! I am also looking forward to one more fun get together with my Class of 2018 girls. We are planning some holiday "giving back" and it will be fun to have them officially pass the torch to the class of 2019. Stay tuned for details! This session had to be one of my favorites from last year's team! We rented a local airbnb for Lauren's shoot. This is a perfect idea if you are wanting your shoot in the off season when the weather isn't ideal. My favorite sessions are always the ones that tell a story. Lauren you were the perfect model for this shoot! I loved working with you and thank you for choosing me for your senior pictures! Once again, I am wrapping up another amazing senior portrait season. I have so many great sessions to share! 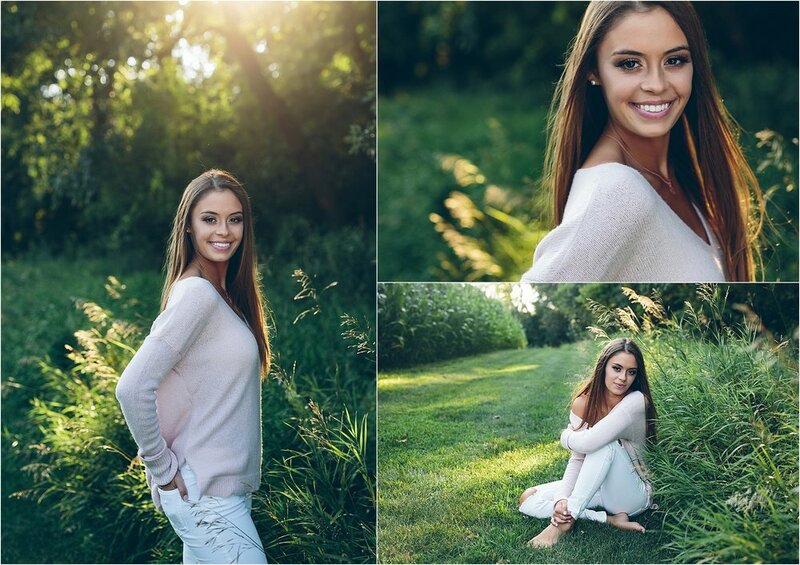 Jillian and her mom contacted me the summer between her sophomore and junior year and applied to be a spokesmodel. Now that's what I call on the ball! I seem to start booking earlier every year. It's not even January and I have almost half of my summer sessions booked for 2018!!! Unreal. I am so honored and grateful that so many of these kids want me to be their senior photographer. Jillian's session was at Pope Farm Conservancy. If you are unfamiliar, this is the place that hosts the annual sunflower days in August. It is always super busy during the peak of sunflower season and I was really excited to be shooting there past their peak this year. This place is glorious, even without sunflowers and it was the perfect spot for what Jillian had in mind for her senior session. Jillian is a dancer and although she didn't really want to do "dance pictures" for her senior pictures she obliged her mama and did some with all her dance shoes from over the years. Just writing this leaves a lump in my throat. I've got a little 3 year old who just started ballet and I can imagine all the hard work and fun it has brought them both. Thank you Jillian! It's been wonderful getting to know you over the past couple of years! It's hard to believe it's back to school time! School supplies, haircuts, new shoes.... It's always sad to see summer coming to an end but also so exciting to start fresh in a new grade with new classes. I will be moving my oldest into UW Eau Claire this year.....gulp! I now have an extra bit of compassion for my moms now that I'm about to send one off myself. It's so exciting to see them grow and spread their wings but so, so hard to let them go. The beautiful Miss Grace and I had an amazing session downton at Allen Centennial Gardens. There is something about her that reminds me of an actress. I can't say who exactly but she definitely reminds me of someone famous! It was darn near impossible to narrow her images down for this post! She really made my job easy! I believe yesterday was her first day back at Edgewood! Welcome to your senior year, Grace! Arizona. The first time I visited Arizona I was sure I wasn't going to like it. I mean the desert is nothing but dry barren landscape, right? It's unbearably hot and dry and there's these prickly things everywhere! Man, I was NOT prepared to fall in love with the desert like I did and it's pretty much been an obsession of mine ever since. Our plan this day was to go see the meteor crater, and then head to Sedona and take pictures there. Apparently the only time it rains in the desert is when I'm there. Really. It's true. The forecast was looking sooooo sketchy all day and by the time we were done playing tourist at the meteor crater the weather was very much visible. The forecast called for rain all night and we weren't going to have much time in Sedona as we were going to need to get on the road the next day to make our reservation for the Tile House in Cali. So, we literally pulled over right outside the crater and shot in a field among the cow pies, ha! The wind was incredible and truthfully a little bit scary. But the sky! It was truly an amazing experience to shoot in these conditions. It's just something you can't plan! The next day the sun was back and we were off to California. We made a pit stop at the Hackberry Store for some quick pictures. Such a fun place. We were there at high noon which of course wasn't ideal for lighting but we made do! We even found a random piano which was so perfect for Peyton! I tell ya, road trippin' out west needs to be a bucket list item for everyone! It's truly the only way to see the country. There's adventure and surprises around every corner! I can't think of a better way to spend a Friday night! These girls are the best and as you can clearly see they had a pretty good time with this! Unbelievably, I have paint left over so I may have to do this again! Maybe with my own kids! I can't believe it but I have started getting ready for the Class of 2019 Senior Spokesmodel application process! I am hoping to have materials ready by the end of summer so if you're class of 2019 and interested in becoming a Spokesmodel, send me a message to get put on the notification list! Ahhhh! A girl and her horse or in this case horses! One of my favorite things to photograph! 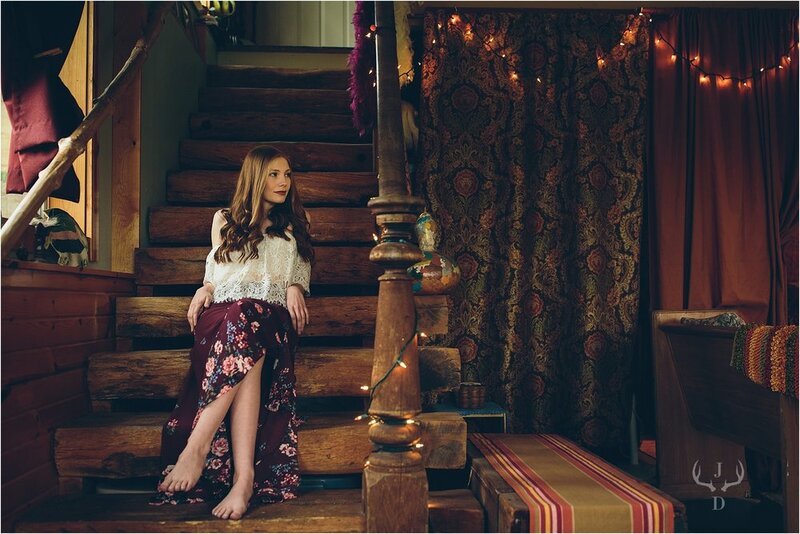 We photographed Emma's senior portraits and her grandparent's house. You never really know what a location is going to be like until you arrive and needless to say, I was extremely pleased with what I had to work with! I don't know a lot about horses but it is always so neat to see the connection between horses and their humans. Emma is so sweet and I just loved her images! Catherine's session has to be one of my favorites from last year! One of my favorite parts of being a portrait photographer is when I have the opportunity to tell a little story. When I sat down with Catherine and her mom for her pre-session consultation I found out quite a bit about what she liked, her hobbies and Duffy her adorable dog! Together we decided on what story we wanted to tell. It was a little road trip with "the Duff" along with some of her favorite things! The light was perfection, the dog cooperated and we found the perfect vehicle to compliment them both (thanks, Jamie)! What are you hobbies? What's your style? What are your favorite things? Some things to think about once you've booked your session. I can't wait to hear all about YOU and design a session that's going to tell your story! Every year I get a message from a Mom asking if I photograph boys. Well I sure do! I love my guys and although I don't book a ton of young men, I enjoy getting to work with the ones I do. There is absolutely no reason guys shouldn't have amazing senior pictures too. Cameron's session was down at the Union on the UW-Madison Campus. Definitely one of my favorite spots to photograph. As of right now, I have just a couple of spots still open for the June special and then we're booking into July! Senior Pictures - Dallas/Ft. Worth - Quad Cities - Wherever else my camera will take me! That time I got to go to Texas and photograph my other "daughter". Love you DeeDee! When Camille and I left Mount Horeb for Milwaukee it was a warm and sunny 70 degrees out. I almost didn't even bring a coat....it was that nice! By the time we got there it was frigid 42 degrees! FORTY TWO!! Oh Milwaukee.....that big and beautiful lake you have!! It sure is pretty but my goodness......30 degrees colder? Well, we didn't let it stop us from having an amazing time exploring the industrial 5th ward. I just love the colors and textures we were able to work with! Camille's session kicks of my Class of 2018 senior season!! I am currently booking for summer 2017. Book your session for June and save $50! But hurry! They don't last long! Part one of our epic road trip last summer! 2. Photograph in as many locations as possible over a 10 day period! The idea to head west last summer came to me after watching one of my favorite music videos. The White Buffalo's "Wish It Were True" video has always spoken to me. I mean it has all the things I LOVE, the junkyard, the abandoned motel, the desert.......THE LIGHT! The first time I saw it I said "THIS! Every last bit of it!" Music has always been a huge part of my life and music videos are one of my favorite places to find inspiration. Now, I thought about contacting a junkyard in the desert and arranging to shoot there but then I realized that sounded way too much like the plot of a low budget slasher flick. "Midwestern girls head west to take pictures in junk yard never to be seen again!" We settled for letting the road lead the way. Stopping when we saw something cool. We hit up lots of back roads, small, dusty towns and old roadside attractions. No road trip out west is complete without your best friend and that's where Miss DeeDee came in. Me, my sister and two teenagers girls. Road trips are tight quarters and there were some "moments", of course! Thankfully short lived! Featured in this post...... The Cadillac Ranch, abandoned motels and gas stations, and The Meteor Crater! Fun, huh? 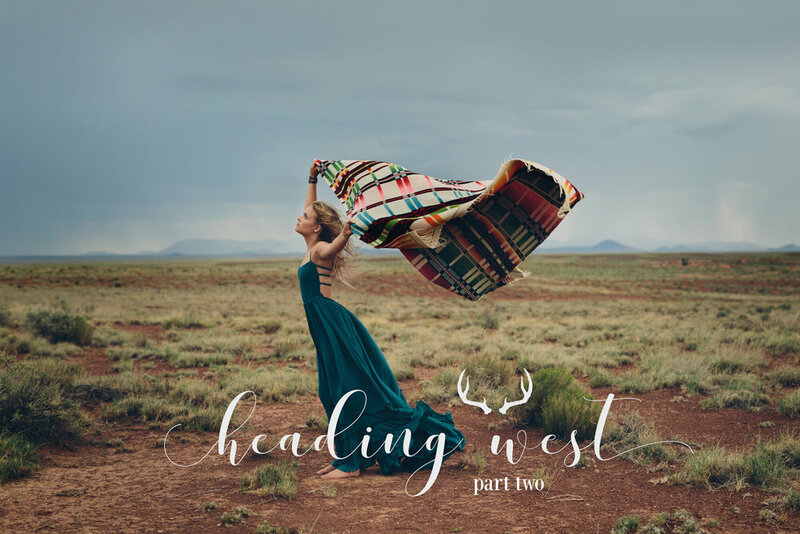 Stay tuned for Part Two of Head West! A few of my favorites from Andrina's shoot. Seriously. I know I say it all the time but I can't help it. I really do have the best job ever! Kirstyn is one of my Class of 2017 Spokesmodels. Can you believe I have already gotten requests to apply for the Class of 2018 positions? Eeek! I have! I will be posting the link to apply for Class of 2018 Spokesmodel positions soon. If you or someone you know want to be part of my team......stay tuned! Or.....feel free to send me an email and I'll put you on the list to be notified when the application form goes live! Now, on to Kirstyn's images. My goal for my senior sessions is to provide a once in a lifetime experience and to create beautiful, authentic images. I want to tell my client's story. A pretty picture is important but I really believe that it's the story, what's just beneath the surface, that's most important in what I do. Yes, I will capture smiling photos for your Grandma and your yearbook but I hope I can capture so much more than that. We all have times when we're giggly, smiling, laughing and having the time of our life. There are also quieter, thoughtful times that maybe not everyone sees. I believe in order to authentically capture YOU, I need to show both sides. We all have a story. I want to tell yours. Now booking senior sessions for Fall of 2016. When you get a call from a long time client and she asks you if you're available to take her daughter's senior pictures in NYC, you don't really have to even think about it. This was my first visit to the city and I had no idea what to expect. I am definitely more of an open spaces kind of girl and truthfully, I didn't think I'd really like it all that much. Boy was I wrong. New York City truly is one of a kind and it immediately stole my heart. This was a first time visit for Hannah and her family as well. What an amazing idea to plan a family vacation and senior pictures into one trip! Hannah was a joy to shoot. Easy going, up for anything and as you can see - absolutely gorgeous! We shot Times Square and Central Park right at sunrise. We figured Times Square would pretty much be insanity any other time of day. If there was one thing I wasn't prepared for in New York it was the sheer amount of people. It was a bit of a challenge at times but I learned pretty quick to embrace NYC's inhabitants and that the people here are really what give this city it's energy. What an amazing, once in a lifetime experience for this young lady! And for me? I'll be back New York. You can bet on it! Ahhh! It finally all came together! My girls are simply amazing and this was sooo fun! Even though it was like 100 degrees out! Ha! A super sweet and beautiful model, an amazing dress from Free People and the UW Arboretum in full bloom makes for one happy photographer! 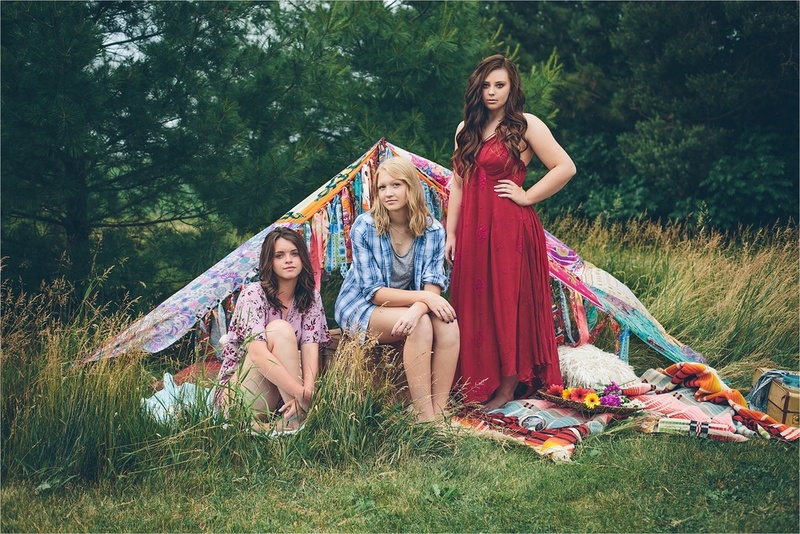 I photographed Montana's model session here on my property south of Mount Horeb. Her session is a great example of how accessories really finish off a look.